Kharkov is a wonderful place where you will never get tired of discovering new things. It is where you can see ancient houses some of which were built 150 and 200 years ago and also ultra modern office buildings made of glass and concrete. This blend makes the city truly interesting and unique. There are lots of things to learn about the first capital of modern Ukraine and even more things there to see! 3/4 century ago it lost its status of the capital of Ukraine (Soviet Ukraine) but it did not lose its beauty. The city is located in the northeast of the country. The population of Kharkov is about 1 453,1 people. 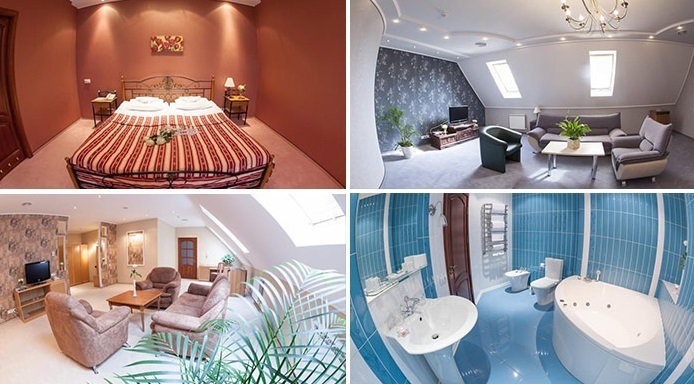 Kharkov has a rich cultural, scientific, educational, transport and industrial life. City hosts hundreds of industrial companies. Even when there was a crisis, the city never stopped developing. There are hundreds of industrial companies in the city which specialize mostly in machinery. Among them there are world famous giants like the Morozov Design Bureau and the Malyshev Tank Factory, leaders in tank production since the 1930s; Hartron (aerospace and nuclear electronics); and the Turboatom (turbines producer). Kharkov's industry also includes food and tobacco processing, printing, and the manufacture of chemicals. Archeological evidence discovered in the area of present-day Kharkov indicates that a local population has existed in that area since the 2nd millennium BC. Cultural artifacts date back to the Bronze Age as well as those of later Scythian and Sarmatian settlers. Founded in the middle of 17th century by a Ukrainian Cossack called Kharkov, the city has had a university named after him since 1805. During the early years of the Soviet union, Bolsheviks established Kharkov as the capital of the Ukrainian Socialist Soviet Republic (from 1917–1934) in opposition to the Ukrainian People Republic with its capital of Kiev. In the 1920s a 150 metres tall wooden radio tower was built in Kharkov. 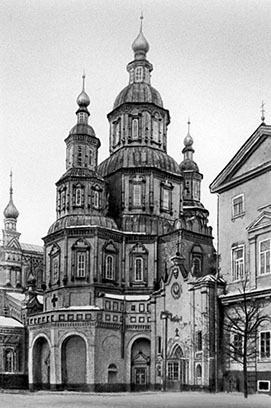 It was destroyed during World War II. In 1934 hundreds of Ukrainian writers, intellectuals and cultural workers were arrested and executed. The purges continued until 1938. During World War II, Kharkov was the site of several military engagements. The city was captured by Nazi Germany and its military allies on 24 October 1941; the city was successfully retaken by the Soviets on 16 February 1943, captured for a second time by the Germans on 16 March 1943 and then finally liberated on 23 August 1943. Before the occupation, Kharkov's tank industries were evacuated to the Urals with all their equipment, and became the heart of Red Armie's tank programs (particularly, producing the legendary T-34 tank earlier designed in Kharkov). These enterprises were returned after the war, and continue to produce some of the world's best tanks. 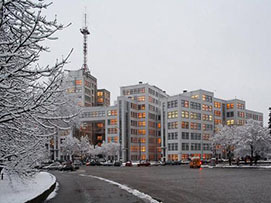 Kharkov was the third largest scientific-industrial center in the former USSR (after Moscow and Leningrad). Talking to his assistants President Harry Truman once said: At the moment we have 3 nuclear bombs at hand, those are for Moscow, St. Petersburg and Kharkov - what a compliment Mr. President!!! Kharkov is Ukraine's second largest city and most country sports are taken seriously there. The most popular sport is football. 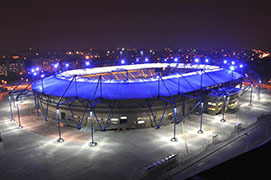 The city has several football clubs playing in the Ukrainian National competitions. The most successful is Metalist that participates in international competitions on numerous occasions. Kharkov also has a hockey club and a female football club Zhytlobud-1. The last one represented Ukraine in the European competitions and is constantly the main contender for the national title. Kharkov is the unofficial capital of Ukrainian Science Fiction and Fantasy. It is the home to popular writers like H.L.Oldie, Alexander Zorich, Yuri Nikitin and Andrey Valentinov. Annual science fiction convention "Star Bridge" is held in Kharkov since 1999. When you are in the city, you will have a chance to see the monument to Kharkov (the founder of the city). The legendary city founder is sitting on his horse in the very beginning of the Lenin Avenue. 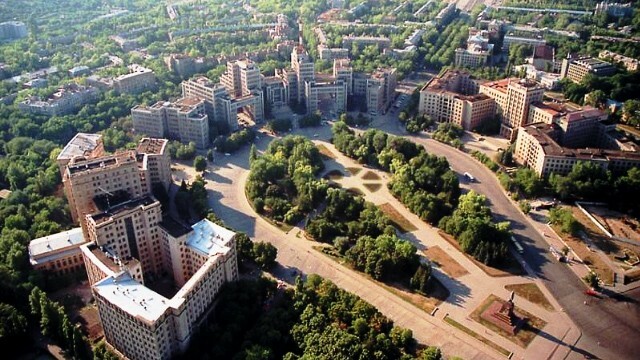 More than a third of the original inhabitants of Kharkov are Moldovans! When the city was a little village, over 9000 men and women from Moldova were given a permission by the Tsar of Russian Empire to settle down in Kharkov (at that time a settlement of approximately 16-18 thousand people). As a reminder of those events there is still a residence area in Kharkov called Rogan, which is a word in Moldavian. Not many people in the modern Kharkov know about the fact that over third of the people who lived there since the city was founded were not Ukrainians. One of the places you should see when you are in Kharkov is the Liberty Square. 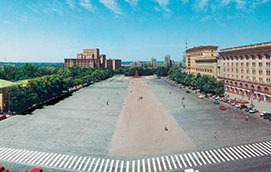 As it was mentioned before, it is one of the largest squares in the world. You will see a few remarkable buildings around it, among which there are Kharkov State University and GosProm. Found in 1805 Kharkov University was the first one in Ukraine, the only University which had 3 Nobel prize winners studying and working there: biologist Mechnikov, an economist Kuznets and a physicist Landau. Kharkov served as the capital of Ukraine from 1919 till 1934, during those years the city was being renovated and modernized hastily and probably the most famous building in Kharkov built at that time was the Gosprom. The Gosprom or Derzhprom (in Ukrainian) was built during the late 1920-ies and was often referred to as the first Soviet sky-scraper, the original height of the building (63 meters) may not impress us now, but at the time when it was built it looked almost surreal and extremely modern. The solid concrete and good engineering allowed Gosprom to survive 2 attempts to blow the building up by the German invaders during the World War II. The city of Kharkov is one of the largest transportation centres in Ukraine, which is connected to numerous cities of the world by air, rail and road traffic. The city has many transportation methods, including: public transport, taxi service, railways, and air traffic. Now, during preparation to Euro2012, city government repaired many roads and changed some of the routes on central streets to make the traffic less heavy. Kharkov's Subway is the city's rapid transit system, operating since 1975, it includes three different lines with 28 stations in total. The Kharkov buses, trolleybuses, street cars and private minibuses carry about 12 million passengers annually. For an extra comfort you can always catch the cab that will bring you to any part of the city for affordable cost. Kharkov is one of the country's main rail junctions. The first railway connection of Kharkov was opened in 1869. The first train to arrive in Kharkov came from the north on 22 May 1869. Kharkov's passenger railway station was reconstructed and expanded in 1901, to be later destroyed during the Second World War. A new railway station was built in 1952. Kharkov is served by an international airport which used to have about 200 flights a day, almost all of them being passenger flights. The Kharkov International Airport was only recently granted international status. The airport itself is not large and is situated within the city boundaries, to the south from the city centre. Flights toKiev and Moscow are scheduled daily. There are regular flights to Vienna, Istanbul and several other destinations. Charter flights are also available. Kharkiv is situated in the north-eastern part of Ukraine. The climate of this city is moderately continental with cool winter and warm (sometimes hot) summer. The average air temperature is 7,5 °С, the coldest month is January (-7,0°С), but in some cases winter months can be quite colder, and the average temperature in July is +20,4°С.